A sporty designer suit, custom-tailored wheels with diameters of up to 20 inches complete with corresponding suspension options, performance tuning for all engines and exclusive interior design: BRABUS now offers an extensive customization program for the new Mercedes SLK. Sporty-elegant BRABUS aerodynamic-enhancement components give the roadster an even more thrilling appearance. The two BRABUS front spoiler lips that attach on the left and right side of the production apron and the striking bezels for the daytime running lights lend the SLK a more striking nose. But that’s not all: the spoilers also reduce lift on the front axle which particularly benefits directional stability at high speeds. The BRABUS side sill attachments emphasize the sporty lateral lines of the car and seem to make the rear fenders wider visually. The rear of the car receives some added sporty character with the BRABUS diffuser and the BRABUS rear spoiler on the trunk lid. The diffuser is integrated with utmost precision into the production bumper and features a centrally mounted rear reflector. These aerodynamic-enhancement components also serve more than just a visual function; they reduce lift in the rear as well. A major contribution to the sporty appearance of the new SLK from Bottrop likewise comes from the BRABUS Monoblock wheels, which are available in various one-piece or multi-piece designs with diameters ranging from 17 to 20 inches. The attached photos show the roadster equipped with BRABUS Monoblock F wheels painted the new exclusive ‘Liquid Titanium’ color. They are mounted in size 8.5Jx20 in front and in size 9.5Jx20 on the rear axle. BRABUS recommends high-performance tires from Continental, Pirelli or YOKOHAMA in sizes 235/30 ZR 20 on the front axle and 275/25 ZR 20 in back. BRABUS sport springs were custom-developed to match the conversion to these king-sized tires. They are calibrated to work with the production shocks, and lower the ride height of the two-seater by some 30 millimeters (1.2 inches). BRABUS also offers various versions of its high-performance brake systems for the new SLK. 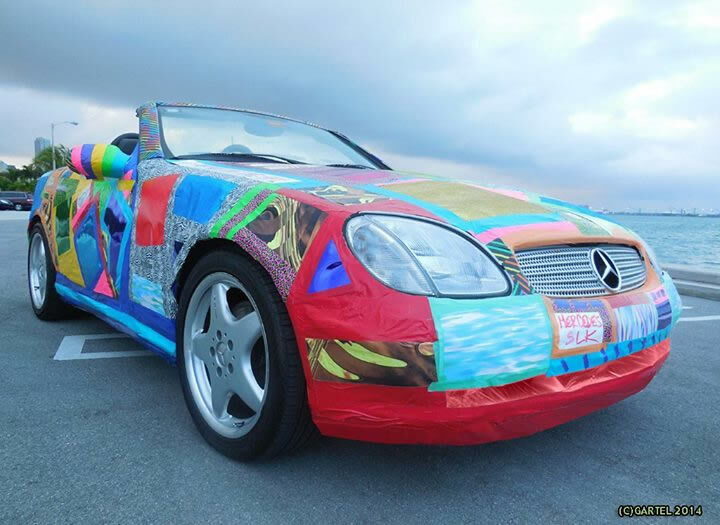 These measures furthermore make the new SLK perfectly suited for some extra power. In a first step BRABUS offers efficient and reasonably priced BRABUS ECO PowerXtra CGI tuning for the four-cylinder direct-injection engines. The processor-controlled BRABUS ECO PowerXtra CGI auxiliary control modules are custom-tailored to each respective engine variant and can be installed by any authorized Mercedes-Benz dealer in less than an hour thanks to their ‘plug and play’ design. All performance kits are backed by the one-of-a-kind BRABUS Tuning Warranty® of three years, up to 100,000 kilometers / 62,000 miles (updated November 2006). BRABUS recommends Aral high-performance lubricants. To retain the engine’s longevity and fatigue strength these kits are designed to only activate the performance-enhancing mapping when all parameters such as engine temperature etc. are in the green. This effectively prevents the performance increase from negatively affecting the service life of the engine. After the installation of the BRABUS ECO PowerXtra B20 CGI performance kit the four-cylinder direct-injection engine of the SLK 200 BlueEFFICIENCY produces an extra 26 hp (25 bhp) / 19 kW of power and an additional 30 Nm (22 lb-ft) of peak torque. 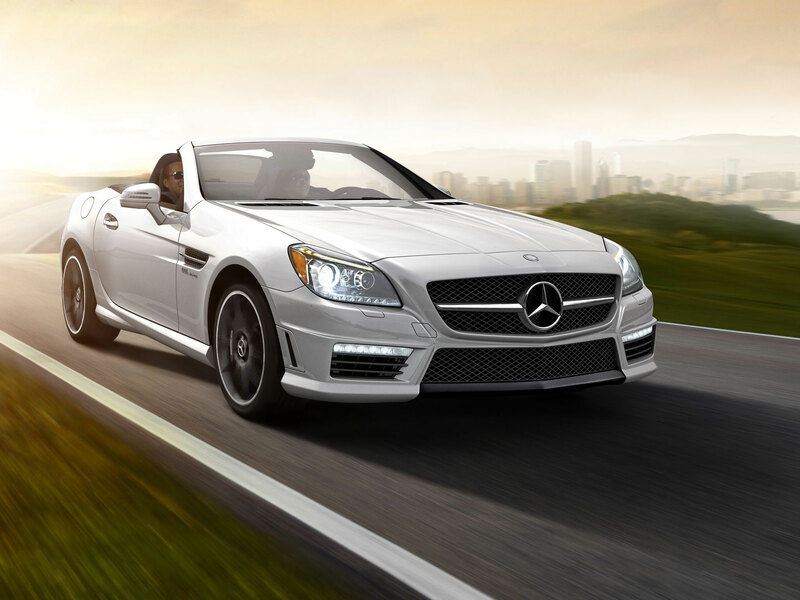 The new SLK 250 BlueEFFICIENCY can be upgraded at BRABUS in two stages. The BRABUS ECO PowerXtra B25 CGI module bumps power output of the four-cylinder direct-injection engine from standard 204 hp (201 bhp) / 150 kW to 230 hp (226 bhp) / 169 kW at just 5,500 rpm. Another ten additional horsepower can be realized with the supplementary installation of a larger intercooler and an electronically controlled BRABUS sport wastegate valve that are part of the BRABUS ECO PowerXtra B25S CGI performance kit. 240 hp (236 bhp) / 176 kW of power and 370 Nm (273 lb-ft) of torque in overboost mode accelerate the two-seater in 6.2 seconds from rest to 100 km/h on the way to a top speed of 248 km/h (154 mph). On the road all CGI engines performance-tuned by BRABUS deliver not just excellent driving performance but also optimized pulling power from low engine speeds and favorable fuel economy. Just as important for the BRABUS engine specialists were exemplary low emissions: like the corresponding non-tuned engines all engines with BRABUS ECO PowerXtra CGI performance kit meet strict EURO V emission limits. The installation of the BRABUS stainless-steel sport exhaust system is advantageous not only for tuned engines. Its four tailpipes featuring the typical BRABUS design not only give the roadster an even more exclusive appearance but also produce an even sportier exhaust note for all engine variants. Another focus of the BRABUS refinement of the new Mercedes SLK is the interior. BRABUS offers an extensive program for the roadster: it includes attractive accessories such as high-gloss polished stainless-steel scuff plates with BRABUS logo and sporty elements such as aluminum foot pedals and shifter. Requests for even more individuality can be fulfilled by the BRABUS upholstery shop in the form of exclusive interiors crafted from especially soft and breathable BRABUS Mastik leather and Alcantara.